Seikatsu is an abstract game designed by Matt Loomis and Isaac Shalev, and published by IDW Games. It’s best for 2-3 players, but can also be played with 4 (in teams) or solo. Setting up Seikatsu is simple. 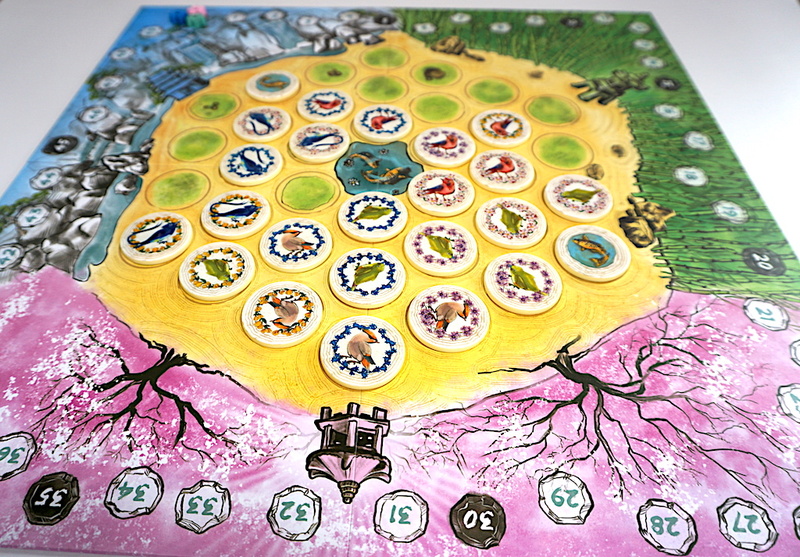 Before drawing tiles, each player selects a pagoda from which they will score at the end of the game (there are three: pink, green, and blue). Then place a random tile on the flower spaces adjacent to the center koi pond that face the player’s pagodas. 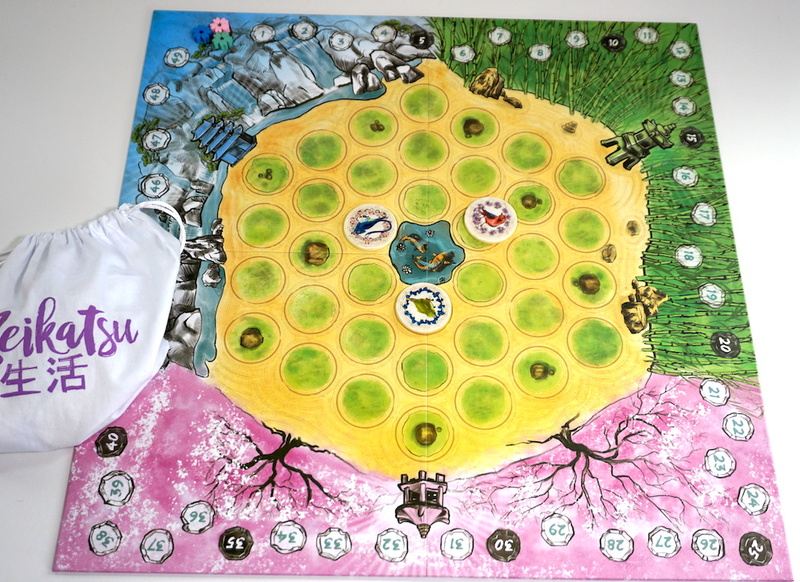 Each player draws two tiles from the bag. Now you are ready to begin playing. Playing Seikatsu is just as simple as setting it up. You have two tiles in your hand; each features a bird surrounded by flowers. On your turn, place a tile from your hand onto the hexagonal board. The tile must be played into an empty space, adjacent to at least one other tile already on the board. Then score any matching birds adjacent to the placed tile. Lastly, draw a new tile so that you again have two in your hand. Scoring the birds is fairly straightforward: if your placed tile is adjacent to other tiles with the same type of bird, you score 1 point for each matching bird and 1 point for the tile itself. If your tile does not touch any matching birds, you score 0 points that turn. Koi (goldfish) count as “wild” birds, but only on the turn they are placed. On later turns, they are worth 0 points. When no tiles remain to be played, the game is over and flowers are scored. The player looks down the rows of tiles on the board from the perspective of their “pagoda”. For each row, scoring is based on the largest number of flowers of a single type; the flowers do not need to be touching. 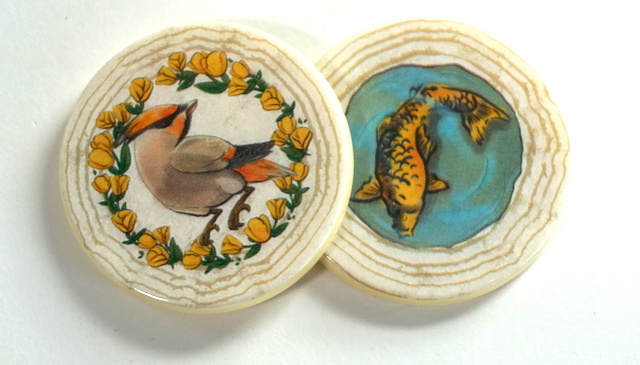 In this phase, koi tiles are wild and may score as any type of flower (even different flowers for different players). Row scores grow significantly with the addition of each flower (using a triangular pattern: 1,3,6,10,15,21). We love the beauty and simplicity of this game. 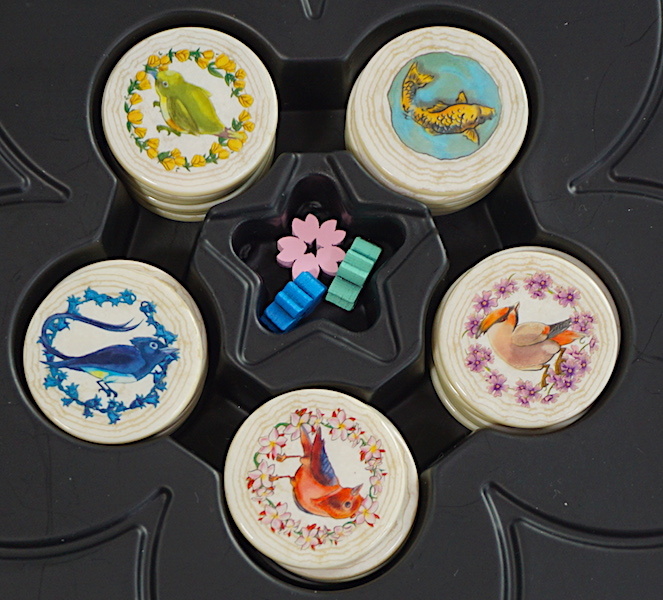 Seikatsu contains a surprising depth of strategy; while playing, you must balance whether to play each tile for maximum “bird matching” points or to increase the flowers in a particular row. Koi are also challenging; they are used to maximum effect when placed near a corner on your longest row, but that won’t always be an option. The scoring by perspective mechanic definitely added to the strategy as well in a wonderful way. As we often try to teach our children, it’s very important to see things from other people’s perspective. Seikatsu allows us to show them how different perspectives can have a dramatic effect on the result. Whether seven years old or seventy, everyone who has played this game has picked up on it quickly. The theme and gameplay weren’t terribly exciting for our children, but turns move quickly so no one had time to get bored. The adults all loved the contemplative elegant gameplay, and we often played two or three times in a row. There are only a few minor drawbacks to Seikatsu. The hexagonal play area is printed on a standard square gameboard; it is a bit awkward to align yourself with the blue or green pagoda, each of which is close to a corner of the square. The pink flowers can be mistaken for the purple flowers until you look at them closely. But these issues are minor and do not substantially affect our enjoyment of the game. If you are looking for a great game to play with just one or two opponents, consider picking up Seikatsu from Amazon. You’ll be glad you did! The Family Gamers were provided a review copy of Seikatsu from IDW Games.